Woof. The holidays were a rough one. I was warned that this year would be the hardest with my mom passing away on the cusp of the holidays. And Thanksgiving right until New Year’s Day went dreadfully slow. Cards in the mail were a roulette wheel of condolences cards and Christmas cards, sometimes a mix of the two. We didn’t send out cards this year after last year’s effort to which someone’s brother said it was “totally gay.” (Why would you tell me that??) Suffice to say, we didn’t celebrate the holidays. In the meantime, the cold weather was a welcome change. We both fell sick and to warm us up, I made a soothing concoction of hot buttered rum. The mix of brown sugar, ice cream, cinnamon and rum topped off with hot water was better than any cold medicine plus it was a nice substitution for dessert. It’s a recipe that easily configured for one person but we were drinking it every night, I went ahead a mixed up a hot buttered rum batter — basically a premixed, bigger portion of everything minus the rum and water that’s stored in the freezer until I’m ready for a boozy treat. Combine butter, sugar, ice cream and cinnamon in a large mug. Add rum and whisk. Top off mug with hot water, mix until butter is dissolved and add more sugar if desired. Drink hot. Oh Darlene. I wanted to leave a comment on your previous post. I am so sorry for your lose and can’t imagine what it’s like losing your mom before the holidays. Thinking of you and your family! I’m so glad to see you’re posting again. My deepest sympathies to you and your family. You mom sounds like a wonderful woman. It seems like everyone I know (EVERYONE!) has been battling a cold the last few weeks. I hope Doctor has been taking good care of you. 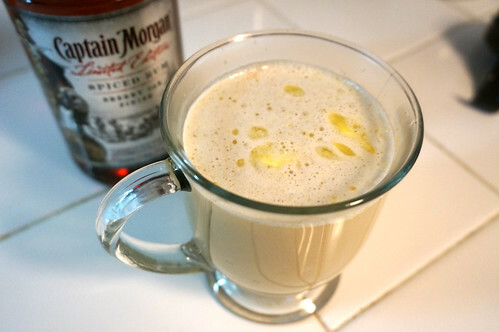 Your hot toddy recipe instantly wins by using ice cream. And I love that you made a batch ready-to-mix. I think Doctor is less of a medical practitioner than a dog proctologist since he’s drawn to smell other dog’s butts. Maybe everyone is San Diego can’t handle the recent cold weather? We’re so delicate out here. 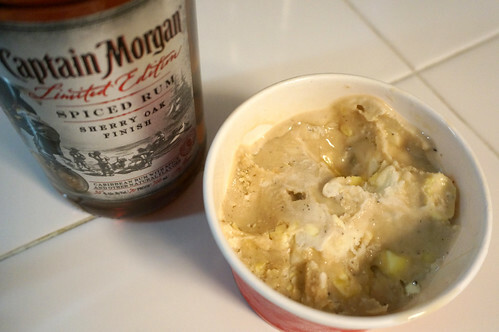 Rum + ice cream might actually make me want to have a hot toddy. It’s great. The ice cream adds a bit of creaminess (and cools down the drink somewhat) without it going overboard. If you’re anything like me when I’m sick, drinking overly creamy beverages and a hacking cough aren’t the best.